At least one good thing came out of NBC's disastrous Sound of Music Live (exclamation point WITHHELD). 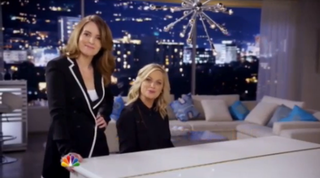 During the broadcast, the network took the opportunity to air its first promo for January's Golden Globes ceremony, which will be hosted by the affable Tina Fey and Amy Poehler. You might be asking yourself, ""What?" I sat through all of Sound of Music Live and I didn't see any Golden Globes promos. When did that happen?" The answer, probably, is that you missed it while you were filling up your wine glass for the tenth time in an attempt to warm up and feel SOMETHING again after Stephen Moyer's rendition of "Edelweiss" left you so, so numb and so, so cold. But let's not dwell on the past! Let's look to the future! All the way to the January 12th Golden Globes where — if the rehearsals are any indication — Tina and Amy will wow us with their musical abilities. These delightful broads are too much.